PugGaming - Gaming Never Done Alone » News » Gaming News » (Moderator: psychockey)Indie Bundles GALORE! There are so many bundles. There have been countless bundles. Many that don't come with steam key codes, and a few that do. And a lot of gamers look for bundles that include the steam keys, because a majority of them have steam and prefer to keep their games all in one area. And steam is a good updater, much better than having to go look for it on your own and keep up to date with every one of the games you play or own... Here are some that are out now, or will be released with in the next two weeks, that will include steam keys! Next, we have the indie gala! I've never mentioned this one when it first came out, but... here's the second one! With the option to get the first one along with it. Now this bundle is a bit confusing. At least, it sort of is for me. But one thing that's cool about it, is that it comes with music! The first bundle came with some music by The Flashbulb, whom I enjoy. This bundle, like HIB, supports charity. The two charities they support are Child's Play and Save the Children. You also get the following albums: Skitter EP, Comfort, and Beautiful EP. You also get the following albums: Skitter EP, Comfort, Beautiful EP, Square, Thank You, and Fit the Paradigm. The albums are: Skitter EP, Comfort, Beautiful EP, Square, Thank You, Fit the Paradigm, and Doodads. You may also gift this bundle to friends, getting not only a discount for purchasing more at one time, but also receiving bonus content! This bundle is ending soon, so pick up as soon as you can if you're interested! You will be able to preorder this bundle soon enough, but as of now... there's not much information on it. That I know of at least. I'll update it once I learn more and inform those who may wish to pre-order that it is available for pre-order..
EDIT: More info and is now available for preorder @ 3.99$! 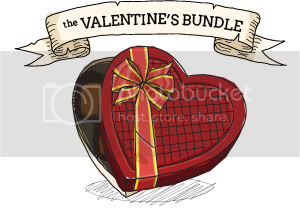 You can now blind pre-order Indie Royale's Valentine's Bundle at a recommended €/£/$10 or €/£/$5 USD contribution, and a minimum of $3.99 USD. The games offered this time include a fantastical first-person action-adventure game (Steam for PC), an IGF-nominated puzzle adventure title (Steam for PC and Mac, Desura for PC and Linux, DRM-free PC, Mac and Linux download), a 'scorching' single and multiplayer arcade-strategy game (Steam for PC and Mac), and a world premiere on PC for a pair of retro RPG-defense games (Desura for PC, DRM-free PC download). The Valentine's Bundle will launch fully later this week at $3.99 USD and up - watch our Twitter feed or Facebook page for immediate notice at launch time. Hoard for: steam (pc and mac) *BONUS* Includes keys for two DLC packs. It is currently priced at 4,55! This bundle seems like it'll be one that will be worth picking up! It is "PWYW" but so long as you pay 1$ minimum. It apparently comes with some other incentives as well, and 20% goes to Child's Play! As I'm sure some may have noticed, there is a minimum now of 1.00 for all the bundles (although indie royale runs differently, so this doesn't apply to it). This is because of all the coal farmers.. But, it can be a good thing they have kept it. Each bundle comes with a number of games, and most are for charity... Should be willing to pay at least a dollar! I'll update for the last two bundles when they're released. so many to choose from which do i get?! groupees one looks like the best one as of yet. Though indie royale seems like it may be worth picking up as well.. we'll seeeee. Which is apparently the start price of the bundles... I could have sworn the started out at 1.99... then went to 2.99.... and now? 3.99.... Maybe I have poor memory, or maybe they're increasing the price slowly... Which, I suppose is fine, especially for them if people still buy. I'm thinking scorching arcade-strategy game is hoard. Maybe penumbra for adventure-puzzle igf nominated game... (but no linux on desura..) maybe amnesia? I think it was igf nominated as well, and has linux on desura. I'm going to go with Amnesia I think.. I have no idea for the world premiere. First person one idk... was looking around and people are thinking zeno clash, which I could see. I wasn't (and still am not) really sure at all! Nope, that's correct - we want to give those who pre-order an advantage, and this bundle has a _lot_ of value in it. Damn, you should have made post about serious sam . I missed it. haha sorry about that! It was a short one; they call it "lightning round" and only lasts... some time idk how long. and hib now has toki tori in the bundle! *BONUS* Includes individual keys for two DLC packs. The be mine one is out now! However.... they're relaunching it tomorrow because it just now got put on... "hold" in a sense, because they are boosting their capacity!